After considerable anguish, I settled on something pretty similar to my first draft of my cultural identity map for my final product. After talking with peer reviewers, I did make two major changes (as well as a number of smaller tweaks). First, I deleted the camera in the lower right corner. It had represented Lacan’s gaze as well as my photography work, but I decided neither were really significant enough parts of my life to merit inclusion on my map. The second change involved two parts: I enlarged and made more central the liberty figure that is now at bottom right. This figure, which is borrowed from the Libertarian Party’s logo, represents my political ideals and how I try to live my life. I also included watermarked text of the First Amendment to the U.S. Constitution in the background of my map, because my studies of the affects of the First Amendment have had a huge impact on my political and cultural outlook on life. 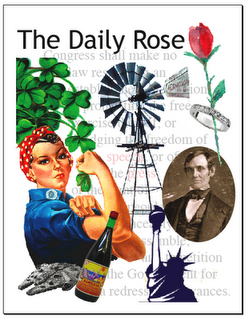 I also made another significant choice in this final map: I chose not to alter the image of Rosie the Riveter. Although I modernized her (OK, let’s be frank, I tried really hard to turn her into a badass) for use on my button, I felt that on my map she represents some sense of tradition, which I am proud of, as well as progress. My map demonstrates my ideas about progressiveness pretty clearly in other ways; I liked Rosie as a sort of nostalgic element.